Deacon Clif Perryman, Archbishop Dennis Schnurr and Rev. Jeffrey Kirch held a Mass of Thanksgiving on Sunday at the Maria Stein Shrine of the Holy Relics. 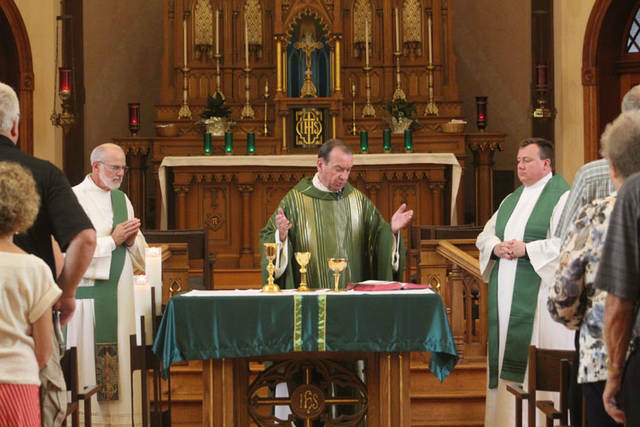 MARIA STEIN – The Maria Stein Shrine of the Holy Relics held a Mass of Thanksgiving on Sunday for the donors who help make the ministry of the Shrine possible. Archbishop Dennis Schnurr celebrated the Mass to recognize the donors who gifted at a specified level. The Mass was concelebrated by Rev. Jeffrey Kirch and assisted by Deacon Clif Perryman, who is also a Maria Stein Shrine board member. After the Mass, guests enjoyed refreshments and the special art exhibit in honor of St. Mother Teresa, located on the third floor of the Shrine and in the newly renovated Upper Room. The exhibit, which is from the Museum of Spiritual Art, will be on display at the Shrine through the end of the year.